Ride your bike. Try replacing just one trip a week with a bike rather than a car. You’ll probably love it so much, you’ll do much more! The more of us that ride, the safer it is for all of us. Learn the law. Take a few minutes to read over the Provo bicycling laws and ride in a way that gives us a good name. When you’re in your car, be on the look out for bicyclists and be sure to share the road. Follow the BikeProvo.org Facebook page. This is the easiest way to make sure you are getting the latest announcements and notices of events, issues, and ways to take action. Talk to your neighbors and friends about bicycles. Let them know why you care about having a bicycle-friendly community. Volunteer at or donate to the Provo Bicycle Collective. Learn bike mechanics as you repair bikes for local people in need. Donate money or unwanted bikes and you’ll ensure all people have access to affordable independent transportation. 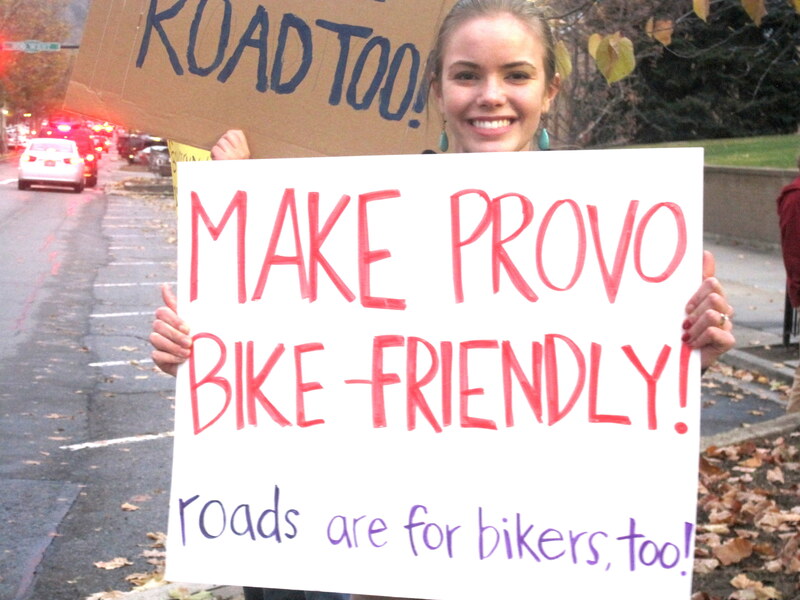 Lend your expertise by joining the Provo Bicycle Committee. Share what you know, help organize events, and advocate for safer streets for people on bikes. Let businesses know you ride. When you roll up to a local shop, let them know you came by bike. The support of local businesses means a lot when crucial decisions are being made. If they know that cyclists are helping them succeed, they’ll be more likely to support bike-friendly street designs. Talk to your city council representatives. Talking to a city council rep is no big deal – remember, this is your neighbor. Let him or her know why you care about cycling and what you’d like to see happen. Encourage your council rep to support funding for bicycle lanes and paths. A friendly call is usually the most effective, but personal emails can work too.